LGBT activists hold signs with the names of transgender people from across the country during a rally in front of the White House on Monday. Like the dictators and despots he adores, President Trump enjoys pouring water on those already fighting to keep their heads above treacherous waves. That’s why his administration wants to inflict more pain on a community that only wants to live openly and without fear. The now-ironically-named Department of Health and Human Services wants to narrowly define gender “on a biological basis that is clear, grounded in science, objective, and administrable,” according to a department memo recently obtained by The New York Times. Trump can’t deport the transgender community. 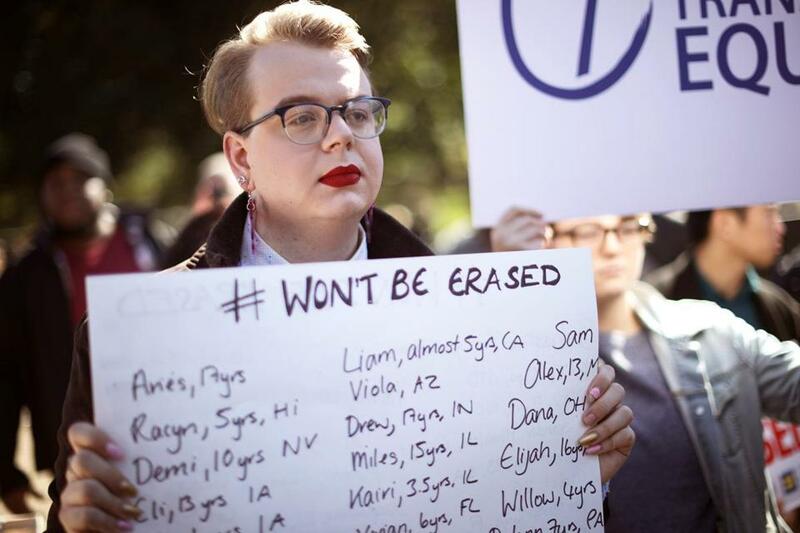 But he will try to erase them. As is common with this petty presidency, it’s another savage dismantling of an Obama administration decision, one that recognized gender identity as representing more than genitalia or labels assigned at birth. With a likely assist from LGBT-phobic Vice President Mike Pence, such a plan would shred the fragile, hard-won rights of this nation’s transgender community. Certainly the intent here is as malicious as it is simple — if their existence is unrecognized, they don’t need federal civil rights protections. 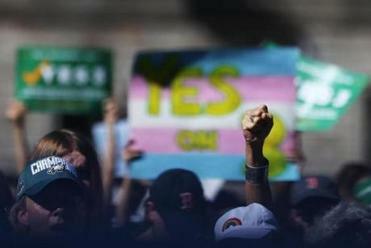 The Globe editorial board urges a vote for yes on 3 to affirm equal rights protections for transgender individuals in Massachusetts. It would be an act of bottlomless cruelty. At the 2016 Republican National Convention, Trump promised to “do everything in my power to protect our LGBTQ citizens.” During a campaign appearance, he even held up a rainbow flag, on which “LGBTs for Trump” was sloppily scrawled. Never mind that it was so wrinkled, it looked as if it had been balled up in the back of a closet. Yet even when Trump seems to be saying the right thing, there’s always an indisputable tell: If he’s talking, he’s lying. And this is rarely more evident than when he professes his great love for a historically oppressed group. Once he moved to the White House, Trump targeted those he had claimed he alone would protect. Last year, he ordered a reinstatement of a ban on trans military service members. So far, various court rulings have blocked its full implementation, but trans men and women have reported problems enlisting. Also, nearly a third of Trump’s judicial nominees, many now confirmed, have significant anti-LGBT records. Trans lives are literally under attack. In 2017, 28 transgender people were murdered. Massachusetts recorded this year’s first known trans homicide victim when Christa Leigh Steele-Knudslien, of North Adams, was stabbed to death by her husband. With 20 other murders nationwide, 2018 may match or surpass last year’s horrible record. Amid such dire news, many are looking toward Massachusetts to see whether voters next month uphold public accommodations protections for transgender individuals. In its endorsement of Question 3, the Globe’s editorial board wrote, “At a time when transgender rights are being threatened nationally . . . now is the time to affirm equal rights protections for transgender individuals” in this state. It may be left to states to uphold basic civil rights, since we no longer have the federal government to protect some of its most vulnerable citizens. With each of Trump’s infringements on human rights comes the unspoken warning that, unless you are straight, white, and preferably male, any one of us could be next. Transgender men and women are our relatives, friends, neighbors, and co-workers. They cannot be sacrificed for a hateful presidency that continues to jeopardize both their rights and their lives.